Hi Readers & Welcome to my 1st 2014 post, where I get this blog back up & running! StellaBella is back on Blogger where it belongs, reconfirming that my motto could never be more true: I am an "Analog Girl in a Digital World". So I thought I would start simple, by telling you about a bit of inspiration I found for our new home in Bay Ridge! I have been washi tape obsessed for awhile now... I love, love, LOVE the infinite amount of multiple uses, patterns, colors, durability; leaves no mess -Wonderful-ness! For as many projects as I have used this tape for so far, I continue to see ideas that I didn't consider. Just type "washi tape" into your Pinterest search, I promise you will get sucked in. So you can imagine how excited I was to see some washi-tape inspiration in my mailbox last week! CB2's Spring 2014 Catalog has arrived, along with a lot of great new products and patterns. 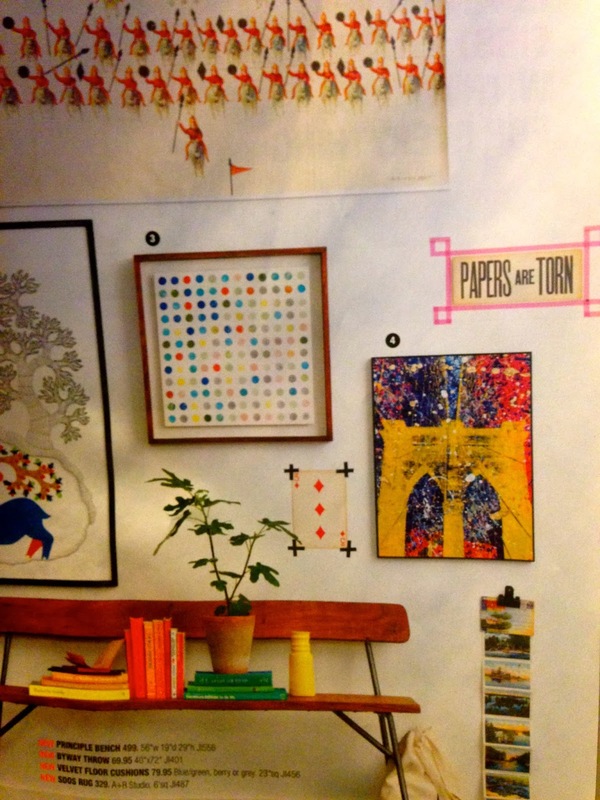 But on page 11, there was an eclectic wall of mixed pieces, and some using washi tape! The pink detailed boxes look like they may have taken more than one attempt to get right, just sayin'. I love the different ways to hang art mixed up on this wall - it not only draws my eye to the details in each piece, but gives a large white space limitless possibilities. You can change, re-arrange, switch out, (and sometimes cover-up), almost as often as you change your outfits! Our homes should reflect the on-going changes in our lives, nothing should ever collect dust, even if that is its only decorative purpose! As I started to clean and put away all of the Holiday decorations, I found myself re-arranging a shelf with picture frames. One photo was given to me from BabyStella's friend who developed it, leaving a lot of white space on 8x10 photo paper. This had been propped up behind the other frames in the back - I had not found a frame for it yet. So, I decided to apply the washi-tape technique - adding it to a wall collection. Maybe I will come across the perfect frame for it, but until then - I'm loving it's new home! This photo was taken 2 years ago during Christmas, the 1st picture of our my mom with both of her girls in a very long time! Baby Stella's friend's husband, Tim Elders took this photo at our favorite Endicott restaurant, Consol's. In my last 2 apartments, I have found a fun place to concentrate my framed photos, shadow boxes, artwork, etc. I called them my "Picture Frame Quilts", and wrote about them here and here. In our new home, we have so much more wall space, that I decided to concentrate these quilts in a tighter and more unconventional space. This hallway is in the center of the apartment; connecting the bedroom, bathroom, kitchen, and opening up to the main room - the dining room. It is still in the works, and I want to dress it with a new pendant light fixture. This collection goes all the way to the ceiling, and I plan to cover as much space as possible. Other than the latest addition of washi-tape art, it is only a concentration of black framed pieces. Everything else is used throughout the rest of the house. Thanks for the inspiration CB2, now it's onto bigger & better projects here in Bay Ridge!